You need to save money! The first thing that the author insists upon is that you need to save money. If you do not save any money, it should be obvious that you are not going to end up rich. Now, how much do you need to save? This is a more difficult question. The author states that if you want to retire in 40 years, you should save 15% of your income. If you want to retire earlier (Early Retirement! ), you will need to save much more of your income. I think that people should try to save as much as they can reasonably save. Before you can save money, you need to get out of debt. This is very important! Your debt is costing you a lot. Maybe a lot more than you think. There is an exception to that rule. You should max out your out employer-matched contribution plan such as your 401(k) (United States) or your second pillar (Switzerland). The returns on these plans are very high. In fact, they are high enough that they are higher than the worst credit card rates. As to how to save money, the author does not go into details. You should get frugal in order to increase your savings rate. There are many ways to be more frugal. You could start with your food budget. Then, you should work out through all your budget expenses and try to reduce them. This is a lot of work. But if you want to increase your savings, you will have to do it. You need to understand finance! If you want to invest the money you save, you need to have some knowledge on how the basic investments work. It is important to know what is a bond and what is a stock. The author gives a lot of information on bonds and stocks. And also about what you should hold in your investment portfolio. There is something very insightful in the book about bonds to companies. A company bond’s holder has no voting right. On the other hand, a stock’s holder has a right to vote. And the interests of these two groups of people are very different. This is a good reason to not invest in bonds to companies but only invest in bonds to the government. Something else that the author insists upon is something that already has been discussed on this blog. Nobody can predict where the market is headed. Nobody can time the market. That means that no fund managers can beat the market for a long time. So you should not invest in active funds. But you should only invest in funds that invest the whole market. Even though this is the safest method of investment, you should be prepared for great losses once the market gets south. There is no way to avoid them, just be ready for it! There is something strange for a lot of people in the stock market. Future returns are generally when than the economy is in great shape than when it is in a bad shape. It can help to recognize the real state of the market. There is a saying around investors: When shoeshine boys start offering advice about stocks, it is time to get out of the market. It is actually very logical. For driving the price of something up, you need new buyers. And a lot of buyers are driven by high returns. So the more returns, the more new buyers are starting to invest. When everyone is invested, only inexperienced investors remains. And their entry generally means the end of high returns. These are forming recurring cycles on the stock market. This is not to say that you can time the market by listening to these signals. But you should be aware of it to avoid going all-in when returns are very high. And also, avoid selling when the market is going down. This may not be obvious, but people are their worst enemy for investing. Emotions are a very bad instinct for investing. People will sell because they are afraid of possible loss. And people will often invest in something because they have seen extraordinary returns in the last months or years. But most of the time, that will be a bad decision. You should not trust your emotions for making investing decisions. Almost all the advice you will receive from the financial industry will be bad advice. Even though they should be professional, a lot of financial advisors are actually not as good at investing as you think. On the other hand, they are very good advertisers. Their job is to make money, not to make you rich. They have actually much more interests towards making fund managers rich than making you rich. For instance, it is highly unlikely that a financial advisor will advise you to invest in low-cost index funds. There are also a lot of mutual funds that are not worthy of your trust. You need to make sure that people, newsletters and websites have the same interest as you before you take any advice. Act as if every broker, insurance salesman, mutual fund salesperson, and financial advisor you encounter is a hardened criminal, and stick to low-cost index funds, and you’ll do just fine. Something really different about this book is that the author is giving you assignments at the end of each chapter. What is really good about these assignments is that the author is actually advising books for you to read at the end of each chapter. Even though this book is tiny, if you read all the books that the author is advising, you will have a very large understanding of investing and personal finance! I actually like a lot the selection of the books that the author is assigning you to read. And it is also good that the author is only advising books from other authors, not his own. For instance, the author is advising you to read The Millionaire Next Door. This is a really great book! Another book that the author advice is Common Sense on Mutual Funds by John Bogle. I have not read this book. But I have read The Little Book on Common Sense Investing by the same author and it was a good read. There are many more books advised by the author. They all look like great options! There are actually very few things I did not like in this book. It was overall a nice read with a nice style. The book does not cover anything about early retirement. It states that you should save 12 years of living expenses before retirement. This is only 12 years because it assumes that social security will bring in the equivalent of 12 other years of living expenses. This will work, but only for official retirement. If you want to retire early, you cannot count on social security! This next point is highly related to the previous one. The author states that someone should save about 15% of its salary in order to retire property. This is, once again, correct if you want to retire at 65. But I would actually advocate you to try to save as much as possible if you want to retire earlier than that. The author states that any fund below 0.5% of Total Expense Ratio (TER) is good. But in fact, you should probably only look at funds below 0.3%, maybe even below 0.2% of fees! This is something you have the power to change! Do not fall for high price index funds. I would consider a 0.5% index funds to be expensive these days. Overall, I really liked this book. Normally, I do not like very small books. But this one really gets to the point. And instead of being extremely long and trying to cover everything, the book recommends some other books to read to complete your knowledge. This is something I really liked about the book. The pieces of advice in the book are really sound. If you follow them, you will be on your way to Financial Independence (FI). The book does not advise extreme frugality or minimalism, but its message is really important. Then, it is up to you to know if you want to take it further or you are satisfied with the teachings of this book. I any case, I would recommend you read some of the other books that the author assign you to read. 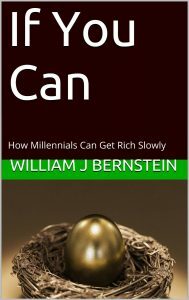 Even though this book is titled for millennials, I think that its message can be applied by anyone. It is probably a path that more millennials are following these days than other generations. But this is definitely something that most people could learn from. If you want to get rich slowly, you can buy this book on Amazon. If you want to read more about books, you can take a look at the best personal finance books I have read. I read this book last year, it is often recommended in Bogleheads community. Book is not bi,g but speak a lot and it can motivate. Yes, it is not big, but for a small book, it contains a lot of information. I have read several small books but they were not enjoyable at all. This book was really nice to read and on point. Thanks for the book review. While it provides some useful information. Keep in mind that voices are loader (and I agree) that cheap index investing is going in a mad direction. Mad in the sense that most indexes are cap weighted which means by investing in an index you buy high and sell low (over-hyped stocks have a high weighing, while out of favor cheap stock might get kicked out of the index, meaning you sell low). Equal weighted indexes are somewhat better, but it’s still only current valuation based. My opinion is that one should diversify also between active and index investing. IMHO the cheapest and best active “fund” (0% fees) is Berkshire Hathaway. It’s also a good diversification from the FAANG-heavy indexes. On another plus side for Swiss investors it does not pay dividends, so no taxes either. Yes, I understand your point! You could also invest in a small cap ETF to diminish this issue. But it would still be cap-weighted. I also agree that some individual shares are not evil! In the future, I am considering moving some of the money into a few individual stocks. It will not be a lot of my money. But I think it will help. Berkshire Hathaway is an excellent example. Previous Previous post: How much will you spend in retirement? Next Next post: What makes Vanguard unique?